Click here to view the Winner’s List. 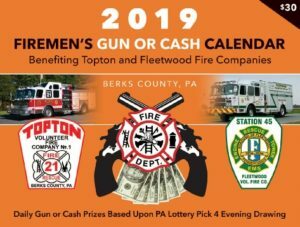 Topton Fire Company, in conjunction with Fleetwood Fire Company, is selling a 2019 Gun or Cash Raffle Calendar for $30. This calendar will have a unique 4 digit number that gives you a chance to win a gun or cash each day in 2019 based upon the PA Lottery Pick 4 Evening drawing. The raffle calendar will be chosen randomly, then opened so we can register the number and mailed to the purchaser free of charge. Raffle calendars will be available beginning in late December 2017 or January 2018. Prizes begin January 1, 2019. Click here to order, or see any member of the Topton Fire Company or Fleetwood Fire Company. Must be 18 years of age to claim prize of gun or money, wholesale value. Each information card must be filled out by purchaser and returned at the time of purchase to be verified by the Fire Company. Anyone that cannot receive prize due to Federal and State law must take cash marked on the calendar. Fire Company will not be held responsible for any improper use of prizes. All numbers are played STRAIGHT as drawn on the EVENING 7:00PM DRAWING. No bonus numbers or additional numbers will be honored. All numbers based on the evening Pennsylvania Lottery Pick 4 Number. All prize winners subject to Federal and State Background Checks. Winner must pay $10 FSSF fee to PA plus Sales Tax. Winner notified by phone or mail and will have 90 days from date of notification to claim prize. After 90 days prize forfeits to Fire companies. Winners will be posted on the website www.toptonfire.com and www.fleetwoodfire.com monthly. No upgrading. Must take prize that you won/equivalent or cash prize. All guns must be picked up by March 31, 2020. All winners are responsible for the shipping cost of the prize won. All guns or cash is handled by the Handgunner Custom Gun Shop, 17 W Weis St, Topton, PA 19562, 610 682-6714. Copyright © 2019. Topton Volunteer Fire Company.